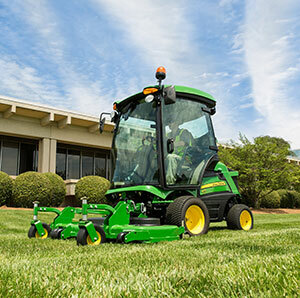 The John Deere 1500 Series TerrainCut Front Mowers offer comfort and versatility for landscaping and governmental operations. The 1550 TerrainCut boasts a 24.2 hp engine, and the 1570, 1575, 1580, and 1585 TerrainCut are equipped with 37.4 hp engine. All 1500 TerrainCut models can be equipped with a 60” / 72” 7-Iron PRO side discharge deck, or 62” / 72” FASTBACK rear discharge deck options. These decks come standard with flat free semi-pneumatic caster tires that increase uptime to finish the job.